This week’s book subtitled The Single Man’s Survival Guide to Thailand, by Neil Hutchison (ISBN 0-9751349-1-9), is an update on a very slim, but very popular publication. I reviewed the original publication (“Money Number One” which is now sold out) and an excerpt of my review is printed on the back cover of the new publication, “I would recommend that the single male, with fire in his heart and conflagration in his jocks should study the book before having his first beer. He will save more than the price of the book.” This is correctly ascribed to “Lang Reid, Bookazine Book Review”, but I should point out that my review was in the Pattaya Mail newspaper. 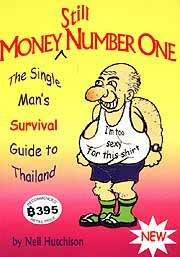 In this new updated version of his book, author Hutchison has realized that the advice which was prompted by the activities of the professional ladies in Pattaya, was actually just as pertinent when applied to the professional ladies of Chiang Mai, Phuket or wherever, and this has widened the scope, without changing the message! Unfortunately, this style of book tends to engender the wrath of many, who feel that it is either promoting prostitution or belittling women. However, it does not, in fact in many ways, quite the reverse. It does accept the fact that prostitution does exist in Thailand (shock, horror - as it does in all countries) and gives advice on how not to become a victim. The book has chapters covering personal safety, drugs, STD’s and AIDS, tips for saving money and not looking stupid, and 20 pieces of advice for those wishing to start a business venture over here which ends “Does all that scare you? Good.” It is obviously then not a book proscribing unthinking hedonism. Certainly it does describe the various types of bar girl, including a chapter on ones to avoid at all costs, and even describes the different types of bars and entertainment outlets. Is this a crime? Not as far as I am concerned, and for the tyro to understand that these places are not just for him, and in fact he is here just for them, puts a very different aspect to it all. Hunter or hunted, the differences get blurred in Thailand. Hutchison does point this out very well. The book also mentions much more than just alcohol outlets, with or without women, and it is in this chapter that I notice he refers to Go Carts, when in actual fact it should be Go Karts, a correction he can make before the next upgrade called “Money Still Always Number One”! At the RRP of B. 395 it has to be the cheapest advice book around that has the potential to save the single man many millions. Should be incorporated in the price of incoming plane tickets and made compulsory reading. As a personal choice, I am not captivated by the cover, which I feel ‘cheapens’ the book in some ways. However, if it had a somber cover, as befits something with real worth, it probably wouldn’t sell as well as it does! A fun read with an important message. Newcastle upon Tyne, England, over the years has given us some of the greats of the rock world: ‘The Animals’, ‘The Police’, and ‘Geordie’ to name but a few (well, perhaps Geordie weren’t as great, but they did give us Brian Johnston, lead singer with AC/DC today). None of these bands were greater than ‘Lindisfarne’ especially in the early seventies. In fact, in the polls carried out in 1972 by the leading English musical paper Melody Maker they were the number one band in Britain, with the Rolling Stones coming second, and Pink Floyd third. Lindisfarne’s rise to fame was as spectacular as their falling back to the ranks of the second division. It all started in 1969, in the folk clubs of Newcastle, when the very talented folk music singer/songwriter Alan Hull decided to try a few of his songs with a backing band. So he called upon his pals in a band called Bretheren (that is the correct spelling) for a few gigs and to record an album which was finally released under the marvelous moniker “Take Off Your Head And Listen”. But a re-think was in order and they re-christened to ‘Lindisfarne’. They made their debut at Newcastle City Hall in July 1970, and then, before the end of the year, released this album plus single ‘Lady Eleanor’ (a song that sounds like a love song, but is actually about a certain lady vampire) on the newly formed Charisma record label, along with other such upstarts at the time like ‘Steamhammer’, ‘Van Der Graf Generator’, ‘Audience ‘, and a little theatrical rock band called ‘Genesis’. Some of these bands became household names; some are now just a distant memory. At first, sales were limited to the north-east of England, but that all changed the following year when the band started non-stop touring. By the summer they were playing at all the major festivals. They had released their second album ‘Fog on the Tyne’, which debuted on the U.K chart at number one, and had a number five hit single with the Rod Clements penned ‘Meet Me On The Corner’, on the strength of which Charisma rush-re-released ‘Lady Eleanor’. This time it roared up the charts and was quickly followed by a re-appearance of ‘Nicely Out Of Tune’ in the album charts. But it is still ‘Nicely Out Of Tune’ that was their finest hour. Of the eleven songs that were put on the original album, nine were written by Alan Hull. Songs Alan had been singing on the folk club circuit for years, but now had been given extra sharpness and clarity by his Geordie mates gathered around him. We also get one song from Rod Clements and one from band mate Rab Noakes. 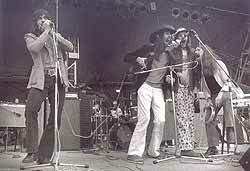 All of Lindisfarne were multi instrumentalists, so there was always plenty of swapping of instruments on stage. There are protest songs mixed in with love songs, ballads, and kick up your heels barn dances. But through it all there is a feeling of fun and kindred spirit. Alan Hull singing ‘The Winter Song’ would send shivers down any spine. ‘Clear White Light Part Two’ is the first song Lindisfarne ever played together, and was the final encore when they once and for all called it a day at their final concert November 1st, 2003 - naturally at the Newcastle City Hall. Listening to it today, it still sounds as fresh as it did thirty five years ago. ‘We Can Swing Together’, although written by Alan Hull, is a showcase for the voice and harmonica playing of Ray Jackson. You cannot help but sway to the rhythm, sing along with the chorus, all the time punching your fist in the air. In concert ‘We Can Swing Together’ would be spread out to over twenty minutes of zany musical madness. Lindisfarne’s time at the top of the rock ‘n’ roll tree was limited. In fact, one more album after ‘Fog On The Tyne’, ‘Dingly Dell’, the band split in two in 1973. Alan Hull and Ray Jackson recruited new musicians and carried on with the Lindisfarne name, while Rod Clements, Ray Laidlaw, and Simon Cowe formed the aptly named ‘Jack The Lad’. They later reformed, but the initial magic was gone. Anyway, by then Charisma were taking a bit more interest of those chaps in Genesis. 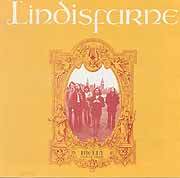 However, for English folk/rock at its absolute best, look no further than this Lindisfarne’s first album.